3-year outdoor Available colours: Red, White/Silver, Green, Yellow, Blue, Orange, Black(*Black is not very reflective). 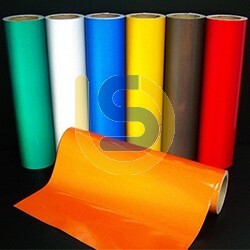 Reflective vinyl is not self-luminescent. Its properties aren’t apparent in normal daylight conditions. It’s specifically designed to be visible at night when stricken with artificial light such as that from motor vehicle headlights. This reflective property is what makes road signs legible after dark without the cost of electric illumination. Because of this, there is sometimes a colour shift that occurs when viewing reflective vinyl in different settings. White reflective for instance is only white when it’s doing its thing. In normal daylight settings, it tends to look slightly greyish or pearlescent At the other end of the spectrum, black reflective has to look different when the light hits it because black is the absence of light. So black reflective looks brownish when it reflects light after dark.